He is man who inspired the United States of America after four years of economic disaster in the Carter administration. He is the man who called out a Communist leader as he stood before the Brandenburg Gate in Germany. He is the man who is largely responsible for the demise of the former Soviet Union. He is the man who restored faith in the American ideal of life, liberty, and the pursuit of happiness. His name – President Ronald Wilson Reagan. Part two discusses the Management philosophy of President Reagan. A plaque that set on his desk in the Oval Office communicates the heart and soul of his approach to management: “There is no limit to what a man can do or where he can go if he doesn’t mind who gets the credit.” He repudiated a micro-management approach and was happy to delegate authority to his staff. He said, “The way I work is to identify the problem, find the right individuals to do the job, and then let them go to it.” So his management philosophy had an inherent trust in people. His desire was to unleash the gifts and talents in others for a the benefit of the American people. Part four focusses on Self-Management. The author zero’s in on the character qualities of courage, authenticity, confidence, optimism, empathy, grace, charm, discipline, constancy, perseverance, and humility to name a few. These are the marks that made the made. The combined total of these characteristics shaped the man that we know as President Ronald Reagan. Emotionally mature Christians are spiritually mature believers. The Godhead is characterized by emotions. The hope of the world is an emotionally mature church. Emotional intelligence is critically important to God-honoring leadership. Scripture undergirds the importance of emotional maturity. Emotions are central to what it means to be human and live life. A biblical theology of emotions is presented and also includes a chapter that helps assess emotional maturity. Part Three helps readers move forward in order to become emotionally mature. Several models are set forth here. Readers are encouraged to pick and choose the models that fit their unique situation. Finally, this work includes an extensive set of appendices. A series of diagnostic tools are offered, which enable readers to honestly assess where they stand on the emotional intelligence continuum. Developing Emotionally Mature Leaders effectively argues the necessity of managing one’s emotions and moving forward in a way that glorifies and pleases God. The theme of sanctifying grace runs through these pages and urges readers to pursue a life of holiness. One disappointing development is the absence of any insight by Jonathan Edwards. I cannot think of anyone in church history who more adequately addressed the matter of the affections. Jettisoning the fine work of Edwards is a critical oversight. Am I doing all I can to reach my God-given potential? Do I seek out people to mentor me or do I let pride get in the way? Am I open to change or stuck in tradition? Has ministry become more of a career than a calling? Do I hold on too tightly to past successes? Have I gotten too comfortable with the way things are? Is everyone else recognizing a problem except me? The author presents different stages in the life of a church from the initial launch, to utopia, whirlwind, increase, merry-go-round, and slow death. Readers are encouraged to evaluate which stage their respective church is currently in. Strategy: How do we get it done? Values: What are the guiding principles we live by? Metrics: How do we measure a win? Team Alignment: Do we have the right people in the right seats moving in the right direction? Culture: How do we change the culture of our church? Services: How do we match what we say is important and what we really do? The author goes into more detail as each question frames a specific chapter. The seven questions are helpful diagnostic tools and should be carefully considered by pastors and church leaders. While nothing harmful is presented in Sonksen’s work, I would prefer to see a more biblically faithful model. Such work is found, for instance, in Andrew Davis’s book, Revitalize: Biblical Keys to Helping Your Church Come Alive Again. The work under consideration may help jumpstart a struggling church. However, it fails to provide the robust biblical groundwork to help a church move forward in a Gospel-centered way. My fear is that a business model is slowly replacing the biblical model, which is presented in the pages of the New Testament. My assessment of this work is mixed. Readers should proceed cautiously, refusing to throw the baby out with the bathwater. But they should also realize that there is no “magic bullet” for church growth or revitalization in the local church. Whenever I have the chance to take a guest to Seattle, one of the first places on the list is Pike Place Market. Anyone that knows anything about Pike Place knows that the tour would be incomplete without visiting the World Famous Pike Place Fish Market. Each guest has a chance to see fresh salmon flying through the air. The seafood acrobatics are matched by an enthusiastic team committed to fulfilling the vision of the market. But there’s nothing fishy about this Seattle-based company. Everything that unfolds before the guests is carefully thought out. The details are revealed in the book When Fish Fly: Lessons For Creating a Vital and Energized Workplace by John Yokoyama and Joseph Michelli. Creating a vision of power and possibility as a team. Enrolling and formalizing individual commitment and team alignment to the vision. Helping team members distinguish between the state of being and the state of doing. Having the leadership redefine themselves as effective agents of change. Assisting team members in letting go of internal and external conversations that rob them of their personal power. Guiding team members to listen to make a difference instead of listening to defend or blame. Helping the crew live their commitment to one another through effective coaching. Assisting crew members as they turn snags into breakthroughs. When Fish Fly is a worthy read for anyone who has a passion to make a difference in the lives of people. Well done, Mr. Yokoyama! 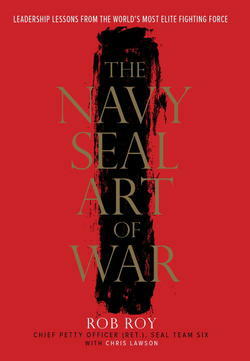 Former Navy SEAL, Rob Roy was inspired by Sun Tzu’s, The Art of War. The result is a book of his own: The Navy Seal Art of War. The book is filled with over fifty chapters of leadership inspiration. Rob Roy shares a wealth of leadership tips from his years in the military in The Navy Seal Art of War. Each chapter contains a short but powerful meditation that will help anyone who aspires to influence others. The author writes, “Real leaders inspire, direct, guide, and give hope.” The book delivers as promised. Roy’s book addresses various leadership topics like planning, mentoring, human resources, mental toughness, devotion, faithfulness, loyalty, and hard work. Leaders from all walks of life will appreciate the approach here. It is a good day to learn a few lessons from the world’s most elite fighting force. Extraordinary teams have a clear leader. Extraordinary teams have quantifiable goals. Extraordinary teams have well-defined roles. Extraordinary teams are 100 percent committed. Extraordinary teams discourage big egos. Don’t let stress result in your blaming others. Don’t let distraction deter you from accomplishing your objectives. Never “take yourself out of the game.” Always stay positive. Under stress, good leaders learn how to compartmentalize tasks so they don’t get overwhelmed and shut down. Stay focused on the mission. Don’t let fatigue or stress deter your focus.